^ 2.0 2.1 2.2 "Program Status Report – Bombardier CRJ Series". ^ Aero India 2007 Bombardier CRJ900 互联网档案馆的存檔，存档日期2013-02-07. ^ The Bombardier CSeries Rolls Out but is it A Game Changer? ^ 6.0 6.1 6.2 Frawley, Gerald. "Bombardier CRJ700 & CRJ900" The International Directory of Civil Aircraft, 2003/2004, p. 64. Fishwick, Act: Aerospace Publications, 2003. ISBN 1-875671-58-7. ^ CRJ-700 Production List 互联网档案馆的存檔，存档日期2014-07-14. ^ A21EA TCDS (PDF). [2014-03-03]. ^ Bombardier Delivers First Enhanced CRJ900 NextGen Regional Jet to American Airlines. [2014-07-11]. （原始内容存档于2014-07-14）. ^ Photos of C-FRJX in its various incarnations as first prototypes of the CRJ-700, CRJ-900 and CRJ-1000. Airliners.net. [2014-03-03]. ^ Comair – Flying First Class with New Aircraft 互联网档案馆的存檔，存档日期2009-05-25.. Comair.com. Retrieved 26 November 2007. ^ Bombardier gets $317M jet order. CBC News. 2 July 2010. ^ Mary Jane. Delta Buys 40 Bombardier Regional Jets in Embraer Rebuff. BloombergBusinessweek. 6 December 2012 [29 December 2012]. ^ TYPE-CERTIFICATE DATA SHEET 互联网档案馆的存檔，存档日期2014-07-14. ^ 21.0 21.1 21.2 Bombardier to deliver first CRJ1000 on 14 December. Flightglobal.com. 7 December 2010 [8 December 2010]. ^ Bombardier resumes CRJ1000 flight tests. Flightglobal.com. 17 March 2010 [17 March 2010]. ^ Bombardier CRJ1000 receives two Aircraft Type Certificates. 10 November 2010 [10 November 2010]. ^ Bombardier Showcases First Air Nostrum and Brit Air CRJ1000 NextGen Regional Jets. 14 December 2010 [2010-12-15]. （原始内容存档于2011年8月9日）. ^ Ranson, Lori. CRJ1000 gains type certification from FAA. Flightglobal.com. 23 December 2010 [23 December 2010]. ^ Nordic Aviation Capital Orders Twelve Bombardier CRJ1000 NextGen Aircraft to be Leased to Garuda Indonesia. Bombardier. 20 June 2012. ^ Canadair CRJ-900 Operators 互联网档案馆的存檔，存档日期2014-08-18. ^ "Delta Buys 40 Bombardier Regional Jets in Embraer Rebuff". Bloomberg Businessweek, 6 December 2012. ^ CRJ700 NextGen Fact Sheet 互联网档案馆的存檔，存档日期2011-07-08.. Bombardier, June 2009. ^ CRJ900 NextGen Fact Sheet 互联网档案馆的存檔，存档日期2011-07-08.. Bombardier, June 2009. ^ CRJ1000 NextGen Fact Sheet 互联网档案馆的存檔，存档日期2009-12-29.. Bombardier, June 2009. 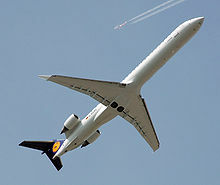 ^ Canadair Regional Jet 900 (CRJ). Delta.com. 2014-02-03 [2014-03-03].